Discussion in 'Colored Gemstones' started by minousbijoux, Jun 29, 2012. Okay, so we talked about it and here it is! This thread is devoted to not just any old pretty stones, but stones we've seen that represent some minimum combination of representative and sought after: color; size, excellent price point, quality cutting and rarity. In essence, a stone that doesn't come around very often, that for whatever reason, you yourself are not interested in purchasing, but wanted to share with the PS/CS family in case somebody here would want to jump on it. There may be other qualities/criterion that folks want to add to the list - by all means, go for it! As promised, the first stone is from Michael Litnon a huge 11.43 carat, pure orange (doesn't have any discernible red), Namibian Spessartite, available for $1,140. Dimensions are 14.8 x 10.9 x 8.8 mm, so some reshaping work could be done to make pavilion facets even more lively if needed. Hard to tell from the photos, but this looks like a fairly saturated, bright "chrome green" 1.05 ct tsavorite, dimensions of 6.58 x 4.62 x 4.29mm for the bargain price of $125. This could be someone's first tsavorite - at a great price! Being sold by one of our own, on the Bistro with a discussion on our own Preloved PS Jewels section of the PS Cafe. Hounddog, voce and ExoticGemstones like this. This one is a great example of size, cutting, and uncommon and outstanding color (IMO); the price is not the best part on this one, but weighing all the other factors, I would think there should be interest in this stone. From Jeffdvs101 on ebay, a 4.15 ct. precision cut VVS neon chrysoberyl from Madagascar, dimensions of 9.05 x 8.50 x 6.88mm. Offered at 1,850 - not the best bargain, but IMO stunning! Okay, now its YOUR turn to post! I wish my first tsavorite was a bargain like that, minous...mine was about 6 times the price! I agree that's one heck of a deal. This is fun! Another green trillion from Roger. Congo tourmaline, untreated. 2.23 ct, 8.15 x 8.15 x 5.85. Haven't asked the cost; I know I can't afford it but I hope somebody can. LOVE the cut. C'mon, folks! we need more postings - where are all the beautiful stones and excellent buys?!! Wow, Minou, I could look at that amethyst all day. Another of my favorite color in zircons. 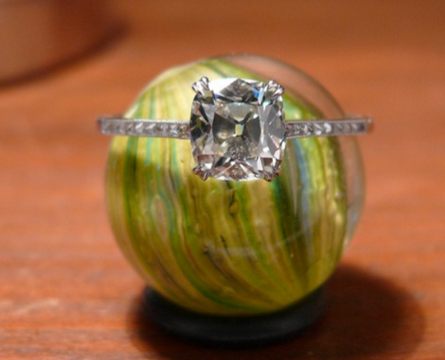 3.06 ct., $400 from Peter Torraca. Yes! Yes! Yes! I've been visiting that one on a regular basis, HKK. You might want to add the stats for others. For its size and color, its a great price. I WANT this bad If only I had the right now! What is the price? I can't find it on the listing. For that sapphire we all love. I have a friend who is getting a big promotion at work and I wants a piece of jewelry to celebrate and I showed it to her. I guess that's not bad for an unheated stone of that size, but my first reaction was "my Lord!" Oh yes, what a gorgeous sapphire! Who needs food if they have that? Love this stone and keep looking at it on Dana's site. He says he'll get more!!! I've been stalking this Merelani Mint Garnet for weeks (Clear Cut Gems). Since it hasn't gone anywhere, I'm guessing it's overpriced for its size? I'm still learning though. Funny thing is that's actually a killer deal for a sapphire like that! 1 year ago I would have paid that in a heartbeat! Sometimes the mind ignores what is logical because the person cannot accept the reality of what it is. Is there a special preview section at Master Cut Gems for the sapphire, or is this from a special preview email? I love the stone. Yahoo, Mac! Post pics if you buy it, please -- and plans for it. Thoughts on this tourmaline ring?